Detective Pikachu (voice of Ryan Reynolds) wakes up in the middle of nowhere with amnesia and the only clue he has to his past is a name and address written inside his cap. Pikachu makes his way to the address in Ryme City and finds Tim Goodman (Justice Smith), who's astonished to find the little yellow creature can talk. 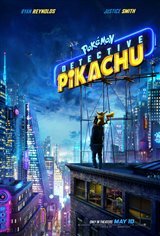 However, the two team up to find Tim's missing father, Harry, in this live-action movie based on the video game Detective Pikachu. Chasing clues through the streets of Ryme City, the dynamic duo soon discover a devious plot that poses a threat to the Pokémon universe.